My graduation gift: a lovely brown from Ovation Pool. 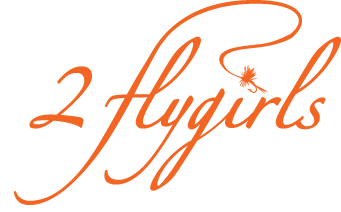 H: July 1, 2011: 1 flygirl was on her way to Canada to be one with the Canadian wilderness and visit family. 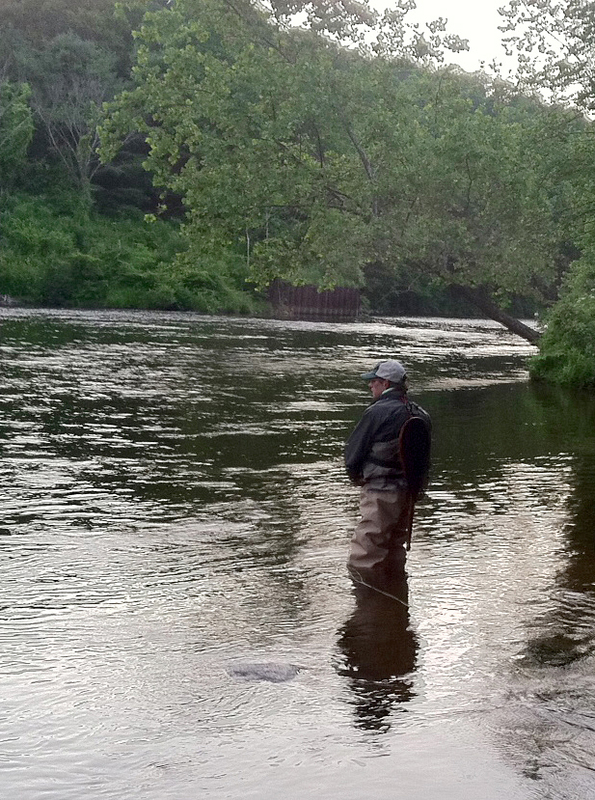 1 flygirl went back to the Farmington in CT to be one with the river and hopefully catch some trout. It was originally to be a solo expedition. But a last minute cancellation allowed Antoine to join me Friday afternoon. My two previous trips to the Farmington river had been marred by heavy rainstorms the night before. This time, weather and water conditions were near perfect. The only potential obstacle I could foresee was an unusally heavy kayak and canoe hatch. It was, after all, the 4th of July holiday weekend. Antoine and I scouted several spots as we drove upstream outside of the TMA. We finally settled on a spot near Riverton. Here, the flows from the nearby dam keep the water temps considerably cooler than downstream. It was refreshing, to say the least, to enter the river and cool off from the late afternoon heat. There was a wide variety of bugs in the air and on the water. We observed several rises, trying to determine what the fish fancied as an afternoon snack. Antoine suggested we try a size 18 yellow mayfly in honor of the vitreous. I deferred to his judgment. Within minutes, I had a fish on and it wasn't long before I had another. 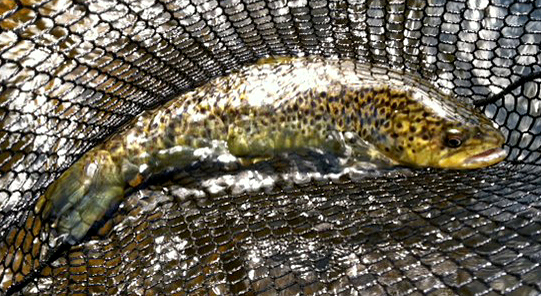 Two anglers had entered the water as I was landing the second fish, an 10-11-inch brown. "Nice! one of them exclaimed. What did you catch him on?" I have no qualms about sharing info with other anglers, hoping they will return the favor. So I told him I had caught him on a small yellow mayfly. He and his friend settled into spots slightly downstream of me. Antoine was upstream having his typical successes. As I had my third fish on, the nearby fisherman yelled out to me, "You wouldn't by chance have another one of those flies, would you?" I just laughed and proceeded to lose the fish as I allowed my rod tip to dip too low. As I checked and dried my fly, I noticed that the angler had moved much closer to me. He had previously been casting downstream. Now he proceeded to quarter upstream in my direction. Antoine (le héron) Bissieux eyeing his prey. We warmed up and moved downriver to fish another spot for the evening. Greenwoods was packed with anglers so we moved to Ovation pool further downstream. Antoine has a favorite spot there, perching on a submerged rock near the shore, like a predatory heron, casting to rising fish 30-40 feet away. I knew eventually he would have one of them on the end of his line. Sure enough he landed one. He said it was now my turn. Nervous for some odd reason, I climbed on to the rock. It felt like a tiny stage and I was suddenly strucked with stage fright, fighting to keep my equilibrium. I proceeded to clumsily cast his rod and catch the fly on my backcast in the tall grass behind me. I knew I couldn't proceed with him observing me and despite his urgings that he wasn't watching, I stepped off the rock and handed him back his rod. "Are you quitting?" he asked. "No, I replied. I'm taking a break." I grabbed my rod, waded to another spot and fished for a bit. But things were slow at Ovation pool that evening. We called it a day and grabbed a late supper. July 2, 2011, turned out to be another fine summer day. I was to fish by myself--something I haven't done in about 10 months. I was feeling adventurous. I didn't want to fish the same old spots I was familiar with. I drove upriver and stopped at a few places before deciding to fish the tail end of a pool that was deserted. It was a spot Antoine and I had scouted the day before. Here, the river bottom was strewn with rocks and boulders of every shape and size, like a haphazardly developed underwater cityscape. Wading here would be very challenging. Having learned my lesson from my last dunking in the Housatonic, I took it slow and easy. "Can we get this over with," he said with his eyes. I cast to a couple of nearby rises, changing flies 3 times--from the wet fly leftover from the previous evening, to a green bellied caddis dry, cream sulpher dry, then a size 20 blue wing olive. On my second cast with the bwo, I had a fish on. It turned out to be a small 10-inch brown. I proceeded to catch 3 more fish (1 rainbow and 2 browns), before realizing I had vowed to take more pictures for the blog and had none to show for my July 4th expedition. I tucked my rod under my armpit, held fish in net with 1 hand, and unzipped the chest pocket of my waders to get my iPhone out of its "drybag" (a ziplock) with the other. 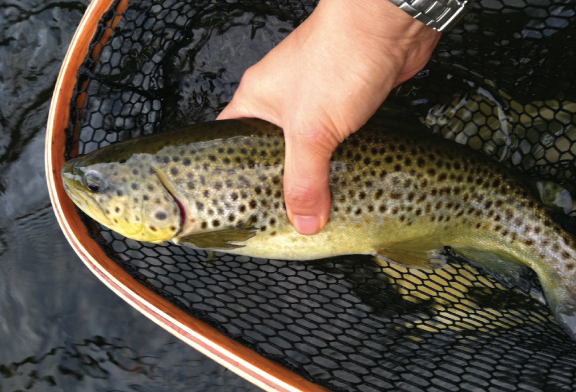 Fearing I might drop my phone into the Farmington, I was satisfied with a hasty picture of the small brown, gazing pitifully at me from the confines of my net. "Can we get this over with," he said to me with his eyes. I quickly set him free and looked up to see an array of bright red, white, blue, and yellow kayaks and canoes upstream. The July 4th hatch had begun--perfect time for a break. My son Michael, who is from CA, will be trying out the Farmington tomorrow...hope he does as well as you !! !